I cannot believe we are nearly in December! With all the snow we have had this week, it certainly feels wintery outside. It doesn't really feel very Christmas-y yet though. We always put our tree up on or around December 1st. We plan on doing that this weekend. Maybe that will help with my Christmas mood. I have bought a decent amount of presents, so I'm feeling decently prepared. To help get you in the Christmas spirit, I've teamed up with some friends to offer you a TpT Holiday Giveaway! 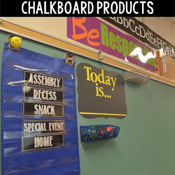 All you need to do is enter the Rafflecopter at the end of this post! You could win one of two TpT gift cards! 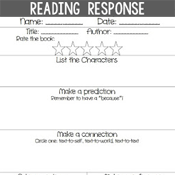 If you win, use it for a Christmas lesson for your class, or anything else your heart desires! 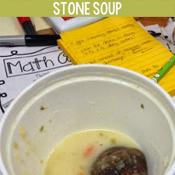 $30 can go a long way on TpT! Just in case you don't win, I don't want you going away empty handed! 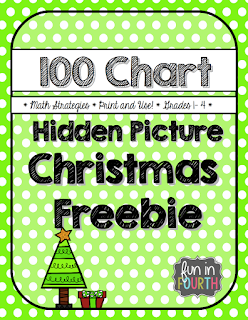 Here's a link to my free 100s chart Christmas themed hidden picture activity! 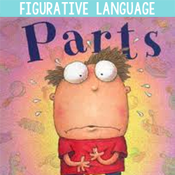 It can be used in any elementary classroom as an early finisher activity or centre activity. This file contains a 100s chart with colouring instructions to reveal a hidden Christmas tree! While we are on the topic of Christmas spirit, here's something that always gets me in the festive mood! My classroom has had an Elf on the Shelf visit the last two years. I sure hope one arrives this year too! 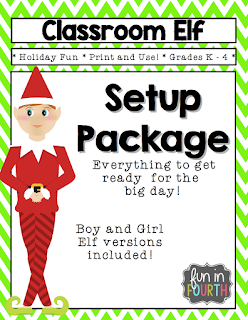 This package includes all you need to introduce your elf at home or at school! There is a boy and girl version of each file and black and white files for most pieces. Have fun putting up your tree this weekend!